Lamp patterns, by five different designers, include 3 inverted ceiling lampshades, 4 table-lamps and 9 swag lamps. Some incorporate bevels and for a challenge, an elaborate 24" diameter old rose dining room lamp. Assembly instructions included. Included are 3 wall sconces, which are convertible to medium swag shades for matching lamp sets. You will also find 2 of the popular inverted ceiling style shades. Most shades are medium sized, suitable for either swag or lampbase applications. 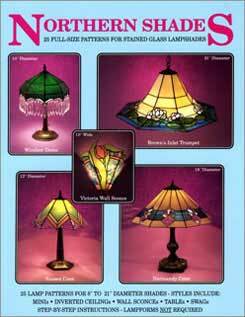 This book contains 16 new full-size patterns for lampshades, many of which feature straight line bevels. The projects vary in difficulty to satisfy both the beginning and professional craftsperson. 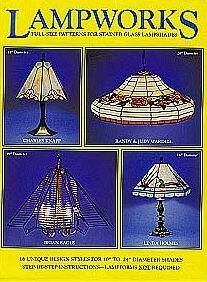 Basic lamp construction techniques are outlined in the GLASS CLASS section and many tricks of the trade are offered throughout this book. Each pattern is supplied with all the information you need to construct the project.